Bumbleberry Farms’ founder transformed a love for bees into delicious creamed honeys (she calls them honey creams). Not plain creamed honey: flavored creamed honeys, in glorious, fun flavors. The business started making 18 jars of honey cream spread at a time, and selling them at farmers markets at the foothills of Pennsylvania’s Laurel Mountains. While the small batches could barely satisfy a growing customer base, family and friends were still needed to help stir pots and fill bottles. Buzz forward a few years and the honey spreads are now made in 100-gallon batches. Beyond farmers markets, they are sold to gourmet food stores, specialty stores like Whole Foods and Williams & Sonoma and gift stores. Everyone has favorite uses for honey, from a cup of tea to a PB and banana sandwich. 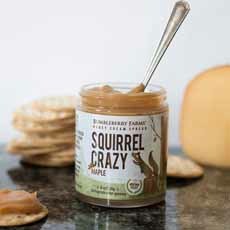 We use it as a bread and toast spread and as spoon candy (we can’t stop eating it out of the jar). Other favorite uses: biscuits and roast, glazes, marinades, popcorn drizzle, yogurt drizzle and as a condiment with cheese. Bumbleberry Farms honeys particularly lend themselves to a cookie break, spreading onto plain cookies (butter, chocolate cookies, graham crackers). Honey has a place at breakfast, lunch and dinner. Here are 30 different ways we use honey. There are also recipes on the website. Honey also has a place in a gift box or as a stocking stuffer. Anyone with a sweet tooth will welcome it. 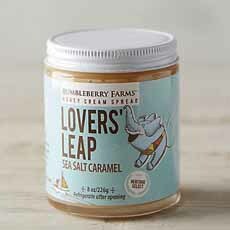 Lovers’ Leap Sea Salt Caramel (photo #4). Pour it over popcorn, sweeten your morning coffee or tea. Warm it for an ice cream or pound cake topping. Molten Lava Spiced Chocolate Honey (photo #1). Turn your breakfast bread into pain au chocolat. Or head to dessert and drizzle it on vanilla ice cream or pound cake. Squirrel Crazy Maple Honey (photo #2). Drizzle it over oatmeal, cold breakfast cereals, French toast, pancakes, fruit, glazed chicken and pork. 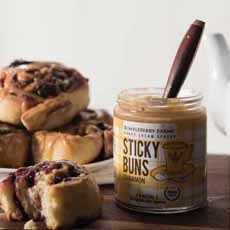 Sticky Buns Cinnamon (photo #3). Make a quick cinnamon toast: Just spread Sticky Buns on biscuits or toasted bread; add some raisins for a cinnamon roll effect. Give some cinnamon flavor to coffee and tea. Honey Cream Gift Set (photo #4). 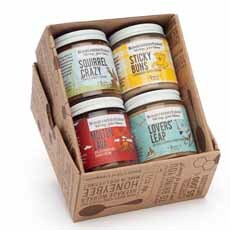 The Honey Cream Gift Set includes 5-ounce jars of each flavor. Eight-ounce jars are $12.50; the gift set is $40.00. Find a retailer near you, or purchase online at BumbleberryFarms.com. 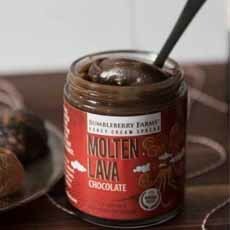 Molten Lava chocolate honey (all photos courtesy Bumbleberry Farms). Lover’s Leap salted caramel honey.